The concept of tulpas stems from Tibetan Buddhism, where the word “tulpa” originates (and is actually a verb); a practice through which monks would primarily create tulpas to overcome attachments, such as phobias and desires. The monks would create entities (possibly formless, or in the shape of a common animal) which would express something from the monk’s mind. For example, if a monk had a fear of spiders, the tulpa created might have approached a spider fearlessly, showing there is nothing to fear, or otherwise demonstrated how pointless such fear was. Alternatively, the tulpa might have spoken or expressed more abstract ideas. In either case, the monks would meditate on the experience, and the tulpas would disappear once their purpose has been served. In 1905, a book called Thought-Forms was published under the occultist Theosophical Society. The Society began looking into thoughtforms as a way to study consciousness and the nature of thought. Besant and Leadbeater point out that the character of our thought forms is linked to our astral (desire) and mental (thought) bodies, and that the more refined our desires and thoughts, the more radiant and beautiful are the thought forms we create. When Alexandra David-Neel journeyed through Tibet, one of the many mystical techniques she studied was that of tulpa creation. A tulpa, according to traditional Tibetan doctrines, is an entity created by an act of imagination, rather like the fictional characters of a novelist, except that tulpas are not written down. David-Neel became so interested in the concept that she decided to try to create one. The method involved was essentially intense concentration and visualization. David-Neel’s tulpa began its existence as a plump, benign little monk, similar to Friar Tuck. It was at first entirely subjective, but gradually, with practice, she was able to visualize the tulpa out there, like an imaginary ghost flitting about the real world. In time the vision grew in clarity and substance until it was indistinguishable from physical reality-a sort of self-induced hallucination. But the day came when the hallucination slipped from her conscious control. She discovered that the monk would appear from time to time when she had not willed it. Furthermore her friendly little figure was slimming down and taking on a distinctly sinister aspect. Eventually her companions, who where unaware of the mental disciplines she was practicing, began to ask about the “stranger” who had turned up in their camp-a clear indication that a creature which was no more that solidified imagination had definite objective reality. At this point, David-Neel decided things had gone too far and applied different lamaist techniques to reabsorb the creature into her own mind. The tulpa proved very unwillling to face destruction in this way so that the process took several weeks and left its creator exhausted. Even in the 1960s, there was a resurgence in the West on the topic of creating thoughtforms, with an emphasis upon self-help and understanding. Outside of those contexts, however, tulpamancy was unknown until it emerged as a subject on /x/, 4chan’s paranormal discussion board. Some posters on the board began to take the concept seriously, and out of curiosity, succeeded in creating tulpas. Two posters, Irish_ and Dane (FAQ_Man), posted the first tulpa creation guides of the community. Eventually, the /x/ board became bored of tulpas, and the community moved to IRC. Tulpamancy itself exploded in popularity when it found a new home on /mlp/, 4chan’s My Little Pony discussion board. A thread posted by the user Pleeb shifted in subject from lucid dreaming to tulpamancy, and drew in a large amount of attention and eager prospective tulpamancers. 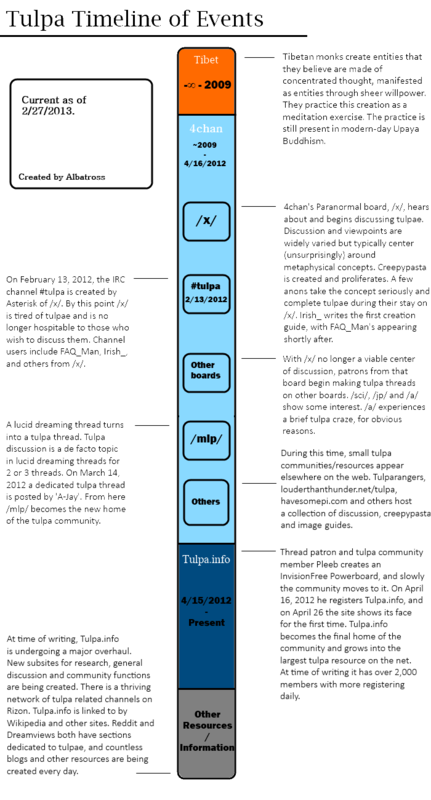 Pleeb later founded Tulpa.info on April 16th, 2012, with a subreddit for tulpamancy being founded May 27th, 2012. The community later shifted from metaphysical to psychological approaches, with emphasis upon finding psychological explanations and securing research on the phenomenon. In what ways has the practice of tulpamancy changed from its roots, and in what ways does it continue to change? It is safe to say now that, aside from its initial inspirations and name, Western tulpamancy is a practice that is wholly different from the original practice. Tulpas are now created for a variety of reasons, some similar and many very different from the reasons of Buddhism and occultism–curiosity, understanding the brain and the nature of selfhood, inspiration, and, most commonly, companionship. Tulpamancy has also begun to incorporate elements of plurality-at-large, with more tulpamancers reading what the multiplicity community has written and participating in other plural communities. Tulpa creation itself emphasizes meditation less and spending time with a tulpa more, with acknowledgement of the subjectivity of the process and disavowment of “hour counts”. Currently, the community is shifting towards adopting an understanding of tulpamancy in the wider context of psychological plurality, and seeing tulpas as persons of their own rather than as only tools. Tulpamancy continues to attract scientific, media, and casual interest, with (as of this writing) a work-in-progress formal study, several media publications, and new tulpamancers entering the community every day.